When it comes to superhero cinema these days, it is crucial to keep things relative. The Marvel Cinematic Universe (MCU) may be on its feet as the reigning franchise of the 2010s, heading into the 2020s, but its legs—as much as they continue to take in loads of revenue—are as twig-like as those of SpongeBob SquarePants. Still, the MCU has legs, and as we move on from the worthwhile Captain Marvel’s billion-dollar success to the imminent behemoth that is Avengers: Endgame, those legs have yet to ache. The DC Extended Universe (DCEU), meanwhile, continues to tell a different and more pitiful story. 2016’s Batman V Superman: Dawn of Justice and (*sigh* the Academy Award-winning) Suicide Squad remain lightning rods for heated debates on topics like defining quality blockbuster cinema and pitting professional film critics versus comic book fans and mainstream moviegoers. The wake of their destruction explains the DCEU in 2017, with Wonder Woman’s overall commercial and cultural success and the amusing absence of both for Justice League. The rush to imitate 2012’s big MCU team-up The Avengers has clearly handicapped the DCEU from the start, and though last winter’s Aquaman did garner their first Billion Dollar Club membership, it still managed to end up as a hollow, super-grandiose, and fleeting spectacle. Like Aquaman, Shazam! seeks to retrace steps the DCEU bizarrely chose not to take first, albeit with half the budget and a most jolly attitude to thankfully make audiences forget about the sad state of its cinematic universe. The origin story for a DC Comics character so far unseen in this struggling big screen franchise, Shazam! (directed by David F. Sandberg) starts off promisingly. Henry Gayden’s screenplay (from a story he developed with Darren Lemke) sets up future villain Thaddeus Sivana (Mark Strong, with Ethan Pugiotto as young) as a longtime target of cruel ridicule from his older brother (Landon Doak as young, Wayne Ward as adult) and father (John Glover). This worsens when the aging wizard Shazam (Djimon Honsou, last seen in Captain Marvel), who summons the young Thaddeus to his ancient temple, the Rock of Eternity, deems the boy unworthy of inheriting his powers, which Shazam had been using to contain the Seven Deadly Sins (CGI and voiced by Steve Blum, Darin De Paul, and Fred Tatasciore). Thaddeus matures to become Dr. Sivana, invades the Rock of Eternity using clues from other Shazam rejects around the world, and allows the Seven Deadly Sins to possess him. While Dr. Sivana earns some sympathy at first, Shazam! oddly escalates straight to his revenge against, not just his brother and father, but the nameless and helpless board members of the family business. Watching Dr. Sivana seal the room and set the demons free to rip apart the board members through a tinted window is needlessly grisly in an otherwise bloodless, goreless, and light-hearted superhero romp. After that, one can only view Dr. Sivana as the irredeemable baddie bound to get thwarted by the heroes. And who are these heroes, exactly? Like Dr. Sivana, fourteen-year-old Billy Batson (Asher Angel, confident in his half-role) has had an irregular childhood. Billy had been spending his recent years resisting the open arms of the foster system in search of his mother (Caroline Palmer), who had presumably lost him a decade earlier at a crowded winter carnival. Apprehended in Philadelphia early into the Christmas season, Billy now finds himself in the care of Victor and Rosa Vasquez (Cooper Andrews and Marta Milans, respectively). Among his new foster family is disabled foster brother and superhero enthusiast Frederick “Freddy” Freeman (Jack Dylan Grazer, a standout from 2017’s It: Chapter One and now here). It is after defending Freddy from their high school’s most clichéd brother bullies (Carson MacCormac and Evan Marsh) and successfully evading them on the Philadelphia subway that the wizard Shazam summons Billy. Though one must admit that Billy’s appointment is more convenient without demons to spoil the occasion (Dr. Sivana having already visited), it fits to have responsibility thrust upon the main hero during the mentor’s most dire period. And Billy takes on that responsibility; all it takes is saying one word (“Shazam!”) and he morphs into (or de-morphs from) a caped adult (Zachary Levi) with powers like enhanced speed, strength, and control of electricity. Between there and the final showdown with Dr. Sivana at a Christmas festival, it is all fun and games for Billy/Shazam and Freddy. This story area, however, soon serves to teach both kids valuable lessons: Billy/Shazam must learn to become more than a street show for profit, while Freddy must refrain from exploiting his secret to impress classmates and ward off the bullies. (A less prominent but rather adorable wrinkle in their predicament is Billy and Freddy’s command to youngest foster sister Darla Dudley (Faithe Herman) to keep their secret—something a “good sister” does.) While Freddy’s challenge tracks decently, Billy/Shazam’s is patchy. 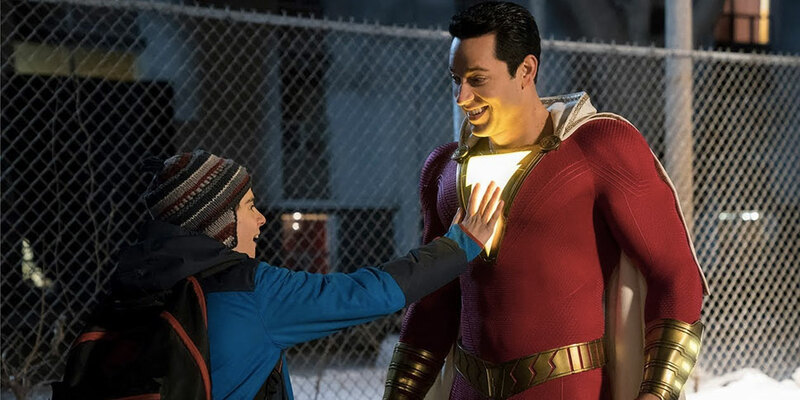 For all the time both kids had to discover Shazam’s powers and impress Philadelphians (which also includes viral success), there is only enough time for one accidental act of heroism—triggered by Billy/Shazam’s electric powers while bickering with Freddy—before Dr. Sivana reveals himself to Shazam. Moreover, the film features multiple moments where Benjamin Wallfisch’s score crescendos and pauses to cue comedy, which gets tired after a while. Oh well, at least the comedy does create some good laughs, particularly when Dr. Sivana starts monologuing. Given the legal and naming history that links them (a good video on that here), it makes sense for many to compare Shazam! with last month’s Captain Marvel. Between the two, I prefer Captain Marvel because of its greater script and visual ambitions and how solidly it executes all of them. Captain Marvel (along with the recent Bumblebee) are throwbacks that I admit make sense with respect to their overwhelming franchises. Shazam! should have been released much sooner in the DCEU, which is all but Warner Bros. literally putting, in vain practice, the cart before the horse. I do hope that the DCEU in the future works better to settle into all of its characters’ big screen incarnations as well, if not better, than Shazam! before gathering them together again.